1028 Visual Therapy Hydrating Lip & Eye Makeup Remover has a gentle pH7.5 formula that is equivalent to a teardrop and with an innovative formulation, it gently dissolves makeup even waterproof ones in just 10 seconds. It not only removes waterproof makeup easily, it also provides cooling effect and moisture boost to the skin as it contains highly concentrated Green Tea Extract, Licorice Extract and Vitamin B5, leaving skin refreshed and hydrated. 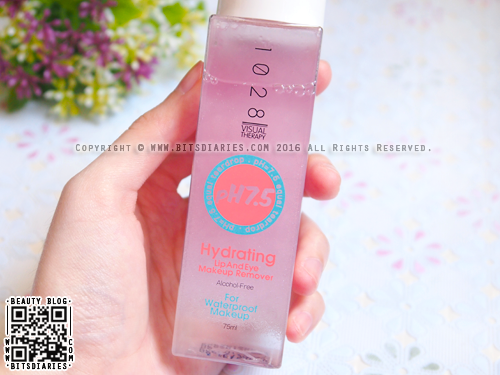 What's more, it is free of alcohol and formulated with low irritation (pH 7.5 formula). Gentle for sensitive skin. 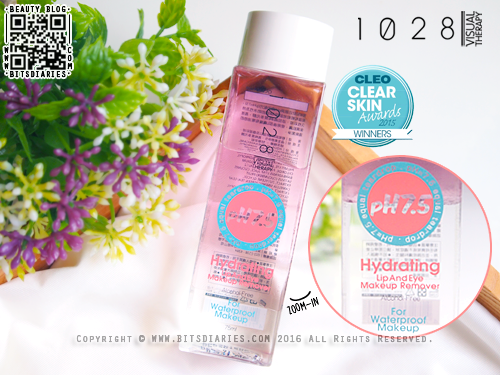 By the way, it has won the CLEO Clear Skin Awards 2015 for Best Makeup Remover. 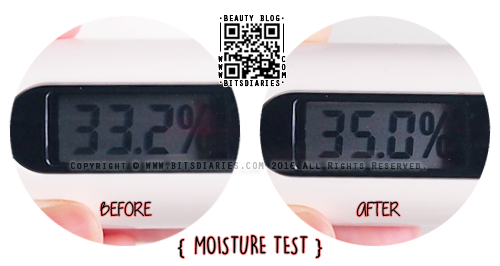 Innovative formulation removes waterproof makeup in just 10 seconds. 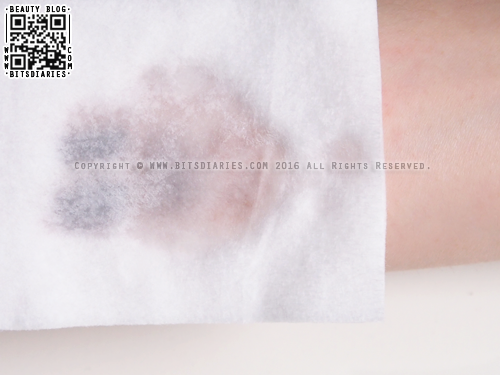 Dissolve makeup thoroughly with no sticky or greasy after-feel. Infused with hydrating skin care essence like Vitamin B5 that provides moisture to the skin, keeping skin oil-free, dewy and fresh. It also contains Green Tea Extract that aids in anti-aging properties as well as Licorice Extract that aids in destroying melanin production, keeping skin radiant. It comes in a plastic bottle with a twist-off cap. Shake the bottle prior to use. The purpose of shaking is to mix the two layers together to form an emulsion. Make sure it turns into a murky mixture. - Both the eyeliner and mascara are waterproof. 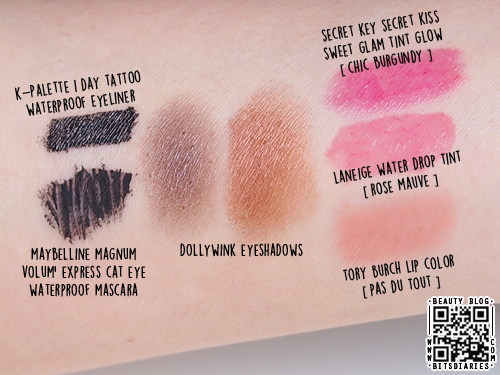 - Secret Key Secret Kiss Sweet Glam Tint Glow (Chic Burgundy) is a tinted lipstick balm. 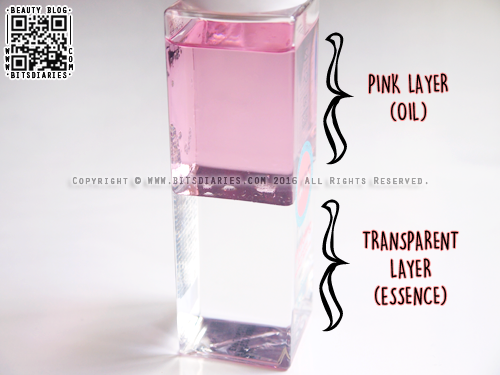 - Laneige Water Drop Tint (Rose Mauve) is a lip tint/stain. - Tory Burch Lip Color (Pas Du Tout) is just a regular lipstick. Ready to put the makeup remover to the test! 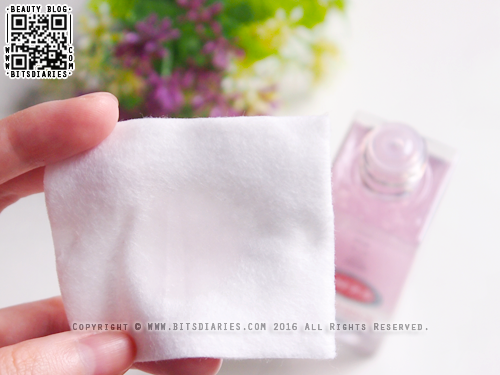 Pour adequate amount of makeup remover onto a cotton pad. 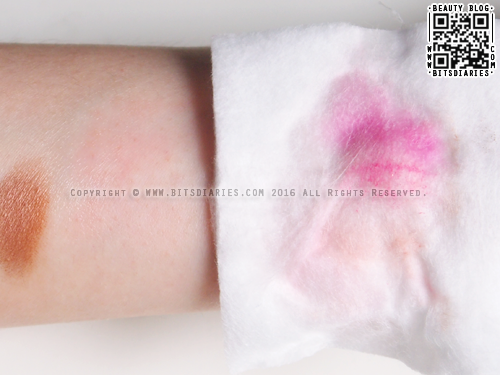 As you can tell from the pictures, it does a good job in dissolving makeup in 20 seconds. 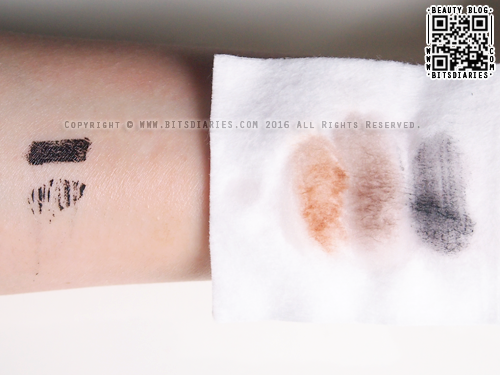 It took away all the non-waterproof makeup in just one swipe! 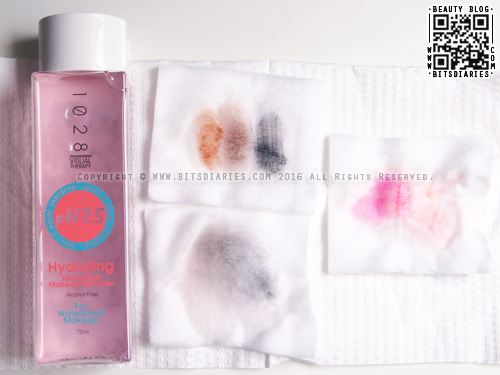 And just like other makeup removers, it may require a few more swipes to remove waterproof makeup and tinted lip product completely. It initially felt a bit tacky, but it didn't leave any sticky or greasy film once it dries up. Frankly speaking, I was quite surprised by how quickly it dissolved and removed waterproof eyeliner and mascara, long-wearing lip tint and tinted lipstick! I'm impressed!! Note: Just to clarify... the mild red patch on my skin in the picture was caused by the residue of the eyeliner and mascara. When they flake off, they tend to become coarse and scratchy. It is not drying at all!! 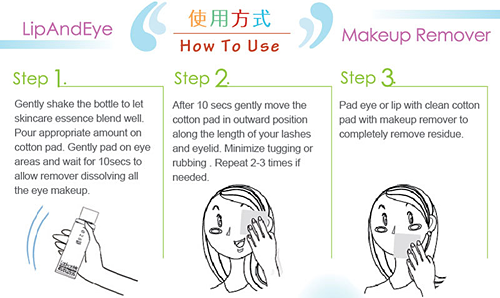 What I like about this makeup remover is that it effortlessly lifts away all traces of waterproof and non-waterproof makeup effectively (with less rubbing and tugging), leaving skin and lip clean and refreshed. It is very gentle — it does not dry the skin and lip, sting the eyes or cause any irritations on the sensitive eye areas. There is nothing I dislike about, but if I really have to say something...hmm...I would say the bottle shape. It comes in a square bottle, which is so damn uncomfortable to hold. I prefer round bottle as it is more ergonomic to grasp than square ones. 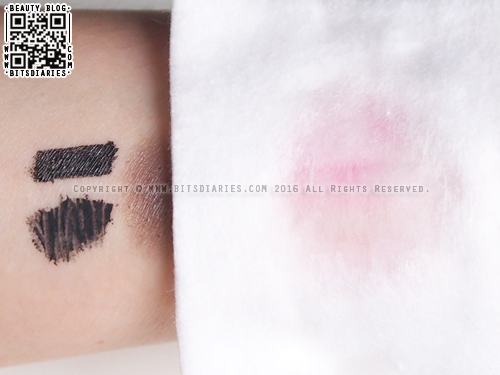 Overall, it is a gentle yet effective lip & eye makeup remover! It is worth to give it a try!